Born in 1965, Pu Zhiqiang graduated from Nankai University as a history major in 1986. By the year of 1989, he was a graduate student of law at the University of Political Sciences and Law. The school, although small in size, was a major force throughout the 1989 student movement. As early as April 17, teachers and students from that school had launched the first march of the year. Pu Zhiqiang joined Chen Xiaoping and Wu Renhua in that march to lay a giant wreath at Tiananmen Square in memory of Hu Yaobang. On April 22, students marched into Tiananmen Square again to participate the funeral. Pu Zhiqiang was there. He was so overcome by emotion that he smashed his own head with a bullhorn, which caught the attention of Liu Gang. Liu Gang tried to talk Pu Zhiqiang into running for the leadership of Chinese Students Autonomous Federation, but Pu Zhiqiang declined out of modesty. 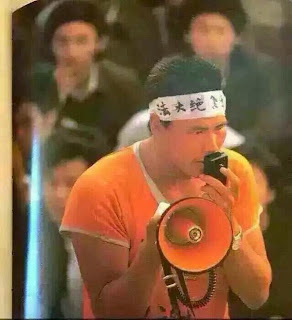 During the great demonstration of April 27, the lanky Pu Zhiqiang was at the front row of his university with the flag of his school. From then on, he could always been seen at the forefront of each demonstration. Pu Zhiqiang in a bicycle rally calling for press freedom on May 10, 1989. 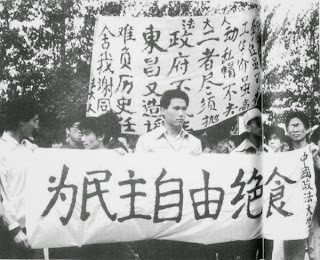 Pu Zhiqiang (center) leads the University of Political Sciences and Law contingent to hunger strike on May 13, 1989. Pu Zhiqiang in hunger strike, May 1989. 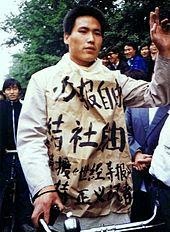 On the night of the massacre, Pu Zhiqiang was in Tiananmen Square throughout the ordeal and was among the last people withdrawn from there. He made a vow then and there that he would return on that day every year to commemorate the victims. For the more than twenty years since, he kept his promise, except for a couple of years when he was detained by police preventing him to do so. Although an active participant of the movement, Pu Zhiqiang escaped serious punishment thanks to the actions of his school officials. He graduated with a masters degree in 1991 and obtained license to practice law in 1995. He gradually becomes a prominent civil rights lawyer, defending many dissidents against the government prosecution, including the famous case of Ai weiwei. He is also very active and daring in social media, often criticizing government's policy. His accounts were often blocked or deleted. In February, 2013, the magazine Southern People Weekly published an issue with him being the cover figure. In the issue, he was quoted as saying, "I kept my principle. They didn't. The people in power today, they are more or less at my age. They had experienced the latter stage of the Cultural Revolution, the liberalization in the 1980s. But at some point of their lives, they gave up and perhaps could never keep their principles. Because they no longer have their grounds." 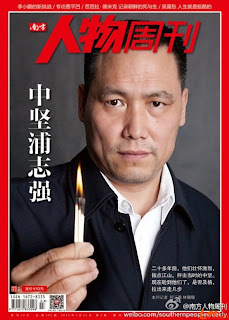 In May, 2014, Pu Zhiqiang participated in a private gathering commemorating the Tiananmen Massacre in Beijing. He was soon detained afterwards. A year later, on May 15, 2015, he was formally charged with "causing nationality hatred and disturbing peace." On December 21, 2015, Pu Ziqiang was sentenced to 3 years of prison but spared of actually serving them, after he wrote a statement promising good behavior. 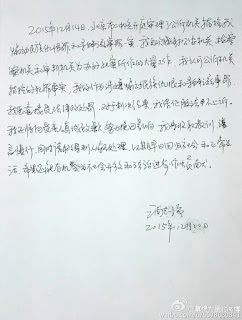 Hand-written statement by Pu Zhiqiang when he was in prison on December 20, 2015.